About our boat & its history. We were thrilled to welcome Sarah Fleischer aboard Lionheart this January. She is an on-air personality at 98Rock from the Greater Baltimore area. Check out her Blog at 98Rock Online. Just getting away from the “Polar Vortex” for 6 days to Clearwater,Florida was wonderful in itself but a real highlight of out little getaway has to be our half day sailing outing in Tampa Bay! 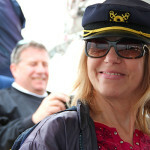 We sailed the Lionheart, a 44 foot blue water yacht on Olde World Sailing Line. It’s not that the weather was spectacular for sailing-the day was overcast with very little wind but warm enough , 70 degrees or so. Olde World Sailing Line provides the most luxurious sailboat cruises on Florida’s west coast. Every one of our Tampa Bay sailing tours is a tribute to the Golden Age of Seafaring – a time when sea travel was the epitome of luxury and First Class service. 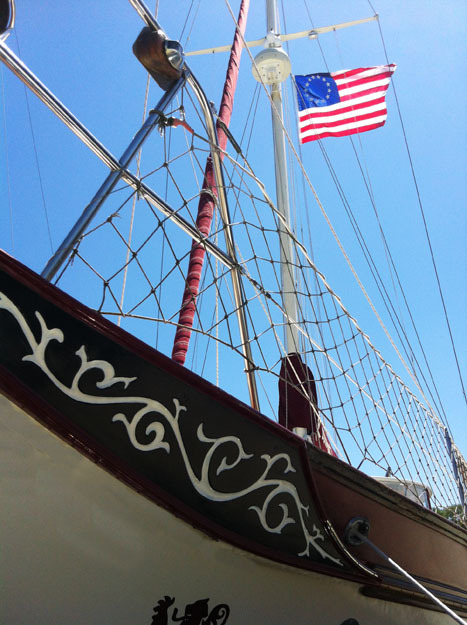 As a “tip-of-the-hat” to this maritime heritage, Lionheart has always flown the Colonial American flag, sometimes called the “Betsy Ross” flag. Our previous company was a hot air balloon operation called 18th Century Aviation, in honor of the world’s first aircraft flight in 1786. Our newest balloon was named “DaVinci’s Dream”, from which we flew the Colonial Flag, thousands of feet over the Tampa Bay area on bright early mornings. 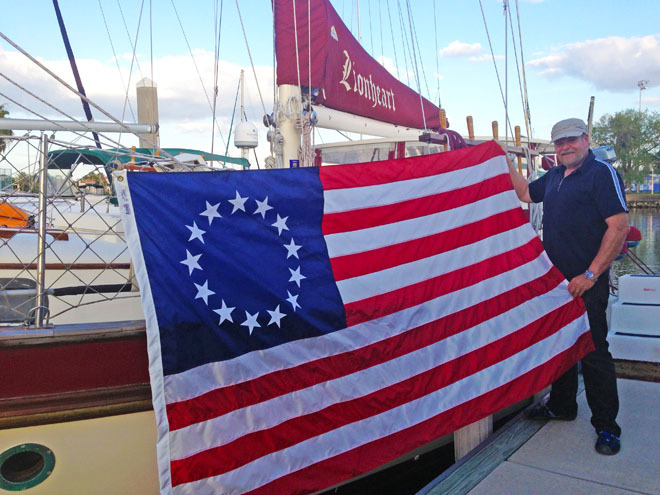 It seemed fitting that when Lionheart was put into service at Olde World Sailing Line, we crowned her with the original flag that flew on DaVinci’s Dream. This flag was a good-sized flag, at 3×5 feet. However, when we saw an opportunity to acquire an even larger 5×8 feet flag, we couldn’t resist. Not until we brought the new flag to the dock alongside Lionheart, however, did we realize how very BIG an 8-ft. long flag really is. 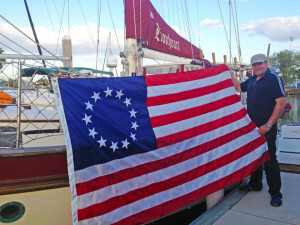 Lionheart is a big girl, however, and once hoisted aloft high on the backstay, the new flag looked wonderful, and fully proportional to the sailboat’s 44’ length. What do you think? 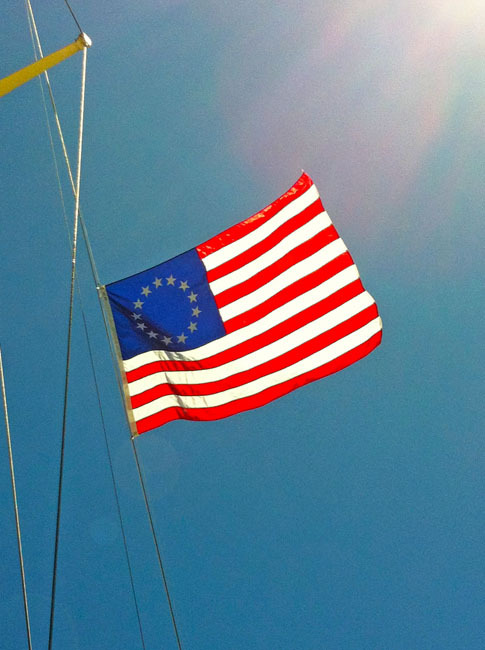 Do you like the circular star pattern of the Betsy Ross flag? Did you know that American historical flags are still considered “official” flags – American Flags remain officially authorized flags, even when newer designs are adopted? The large new flag looks great, but we are bit saddened to replace our DaVinci’s Dream original flag – it brings many happy memories. 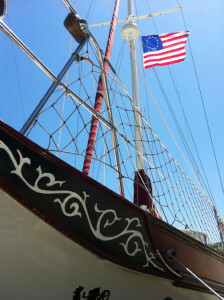 However, any flag on a sailboat cruise takes a beating. We’ll relegate our beloved 18th Century Aviation’s flag to a safer indoor locale. And if you’re in the downtown Tampa area near the Convention Center or Bayshore Drive, see if you can spot the huge Betsy Ross flag flying from Lionheart. Give us a wave! On March 1 Jeff Yates posted on our Face Book fan page about Lionheart, “Love these old CSY yachts, why because I helped build every one.” CSY’s (Caribbean Sailing Yacht) were designed and constructed right here in Tampa throughout the ‘70’s and 80’s in a ship building facility near the Gandy Bridge. The Tampa Bay Area was then home to more yacht producers than anywhere else in the U.S. I continue to be amazed at how many people I run in to in the Tampa Bay Area who proudly proclaim that they worked at the CSY factory – and most for very long tenures. All exude extraordinary pride in the craftsmanship that went in to every one of these beautiful yachts. Though the CSY was one of scores of world-class sailing yachts built on Tampa Bay’s shores, its mission and product were very unique in the industry. The CSY corporation did not have a retail dealer network like other boat manufacturers. These ships were not built for the mass market, but were designed for CSY’s own commercial operations in the Caribbean. And they were “overbuilt” in every way. Strong, stout, heavy boats that could be safely and comfortably at home in any ocean in the world in most any weather. Yet CSY’s were blessed with marine architectural designs that made them world-class sailing vessels, from the lightest winds to gale force blows. 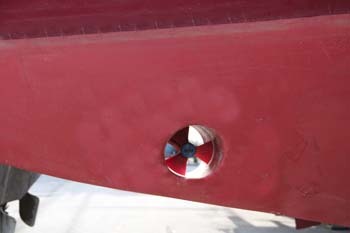 The boatyard went through 5 sets of saw blades in the installation of Lionheart’s bow thrusters. 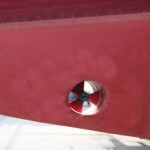 through-hull hose fittings are solid bronze – not brass or steel. Some of the most identifiable features of CSY’s are the generous use of exotic woodwork and the fine craftsmanship displayed throughout and the hand-carved bowsprit, reminiscent of the grand sailing ships of the past. You’ll find very little plastic or veneers on a CSY. Lionheart has a very special history in that she spent most of her life in the fresh waters and short sailing season of the Great Lakes. Time has treated her well. She is an excellent example of the products of these world-class craftsmen (and women) and designers of CSY, as well as the business acumen of this corporation. Thanks Mr. Yates for reminding us of this heritage – we look forward to putting you at the helm once again. Sailing in Florida’s late summer is problematic at best – winds are generally extremely light and sometimes non-existent, with the days punctuated with often violent afternoon thunderstorms. It is an ideal time for haul-out and maintenance chores in preparation for the generally excellent conditions Florida waters offer sailors throughout most of the year. For Kathy and I, this year’s routine maintenance has been magnified many times over. Lionheart is a new boat to us – the culmination of a year long search. We located her on Lake Michigan, near Chicago and had her shipped by semi-truck to a St. Petersburg shipyard for retrofitting. Even for a boat in excellent condition such as Lionheart, refitting is a time intensive and laborious undertaking. 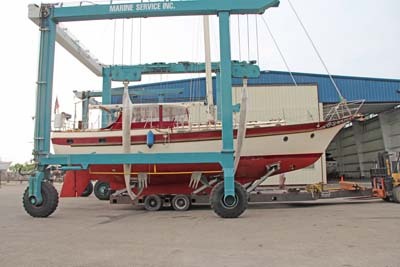 Installing new equipment, buffing and waxing the hull, and applying fresh anti-fouling paint to the bottom were only the beginnings the six-week retrofit. Lionheart was finally “splashed” in mid-August 2012. The sight and sounds of our 35,000 pound, 44 foot-long treasure being deftly lifted from her shore side cradle to the water’s surface was nerve wracking. And I still feel guilty placing this iconic vessel that spent her lifetime in the cool clear fresh waters of Lake Michigan into Florida’s tropical briny seas. But it was saltwater she was built for – right here in Tampa shipyards. Lionheart is a CSY 44 (Caribbean Sailing Yacht), designed and constructed specifically to commercially ply the waters of the Caribbean Sea. CSY yachts have always been known the world over for their classic “clipper ship” appearance and also famous for their extraordinary strength, bronze fittings, seaworthiness, and sailing prowess. Today CSY’s can be found cruising in every ocean of the world. Following “splash day” and subsequent vessel rigging, Kathy and I were thrilled with the initial sea trials and the fall months that followed giving Lionheart a chance to stretch her legs and show us how best to squeeze every last knot of boat speed from the winds. She sails surprisingly well even in light air, but is particularly in her element as the winds pick up. Lionheart loves to sail, and her massive construction makes her an extremely comfortable and safe vessel. From the outset of our business model for Olde World Sailing Line, our vision was to share the joy and adventure of sailing, while paying tribute to the elegance and amenities of the golden age of seafaring. We believe a sailing excursion should be a magnificent, luxurious event – reminiscent of the opulence and majesty of an early 20th Century ocean voyage. The trip should become a moment captured in a long-lived memory. We believe Lionheart is the perfect setting for your special event. Kathy and I hope you will join us on a sail that may well become one of your most precious moments.